On February 27, 2013, 61-year-old Thomas Birdsall walked into a Sudden Service convenience store to buy a hat. Since purchasing any sort of clothing product from a convenience store comes with the risk of immediate disappointment, Birdsall also requested a receipt. Unfortunately, the employee who rang up his order had already thrown the proof of purchase into the trash. To her credit, she began digging around in the garbage to retrieve it...but apparently not fast enough for Thomas, who began yelling and swearing at her. At this point, a store manager intervened and asked Birdsall to leave, which he did. But after walking across the parking lot to his truck, he came back towards the store holding a high powered pressure washer. The clerk, who had stood outside to make sure he vacated the premises, feared for her safety (and any product she may have had in her hair) and retreated back inside the store. Birdsall, however, would not be denied the immediate gratification of a watery revenge. While store employees looked on in disbelief, the receipt-less and very disgruntled Birdsall began pressure washing the sidewalk and front doors of the store. He then got in his car and left while the manager called the police. 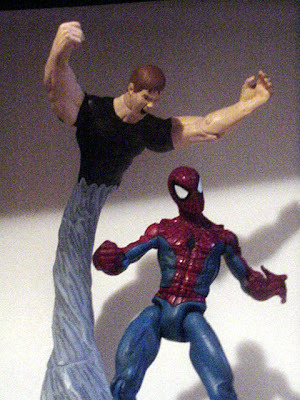 Hydro-Man and Spider-Man goes, as well. When the officers arrived, the store manager claimed that Birdsall (who lives nearby) had been harassing employees at the store for the past seven years. A good front area cleaning, however, was apparently the last straw. This was also not the first time that Birdsall has been in trouble with the law. In addition to having several outstanding warrants for trespassing and disorderly conduct, he was also busted last year for attempting to run over a teenager in a Walmart parking lot. 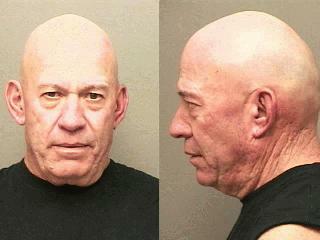 Birdsall was arrested that evening and charged with assault, disorderly conduct, and criminal trespass. The owner of the store was advised to get a restraining order against him. If you live in the Clarksville, Tennessee area and ever find yourself in a situation where your property is unexpectedly being cleaned by an angry bald man, please contact the Clarksville Police Department.